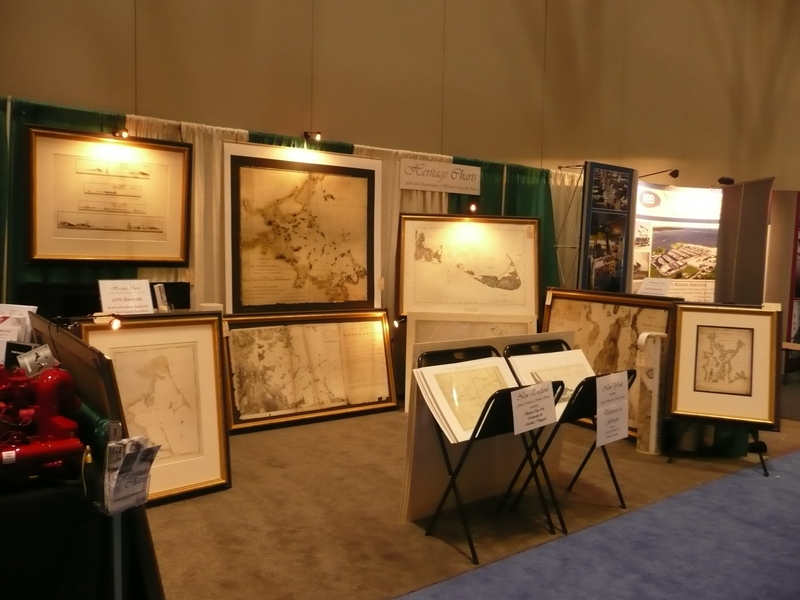 We were delighted to have been able to present our collection of historic charts, maps and plans at the prestigious Newport RI Boat Show. It is about 6 months since we were in Newport and it was, of course, very different from the cold, sleepy and rather white little seaport town that we encountered back then. Newport is never more beautiful than in September with the still warm days of summer lingering, if as any local will tell you, you can put-up with the ever-present threat of showers and hurricane strength winds! The show was important for us as we have in our collection some beautiful 18th century charts and maps which we knew had never been seen in this historic town before. All of our collection focusses on the coast-line of the eastern seaboard and Narragansett was, back in the 1770’s, a hugely important region for the British navy. The charts are of no less appeal nowadays to those who currently sail the waters and are interested in the hydrography, the history or indeed just the beautiful art-work. We were delighted with the response and attention we received on-stand from all who saw us. Lisa DiRaimo of the Rhode Island Maritime Trades Association (RIMTA) who had the stand next to us, was fabulous company and just a wealth of helpfulness and joy. Thank you Lisa! Lisa Knowles, Sales Manager for the Newport Exhibition Group who encouraged us to attend the show in the first place – we still have a couple of charts with your name on them Lisa!.. Merrilee Zellner, proprietor of the William Gyles Guest House in Newport, who apart from accommodating us in her fabulous establishment throughout our stay was the font of all knowledge of the people and the town of Newport. Thank you Merrilee for your walking-tours, sheer ‘positiveness’ and enthusiasm. Thanks also to Heather Jernegan and Steele Sartwell of ‘Not For Navigation’ who shared their experience of exhibiting and moments of respite between customers. We hope to see you both again at another show..
On to the New England Boat Show in Boston. We were getting the hang of how things worked now, so we got ourselves set up fairly easily. We had a bigger stand here, so we could spread out a bit more and show a few more charts which was good. The large plan of the Bay and Harbour of Boston [dated between when George Washington took command of the American army in July 1775 and before the American occupation of Dorchester Heights which finally forced an end to the conflict in March 1776] was the star of the show and acted like a magnet to the good folk of Boston and drew them onto the stand. Everyone was fascinated at what Boston used to look like before landfill, but much of the detail is still recognisable today and generated much discussion as to where they lived or boated. The film “Shutter Island” had just been released, and we were able to identify it from this 1775 chart as Peddocks Island! 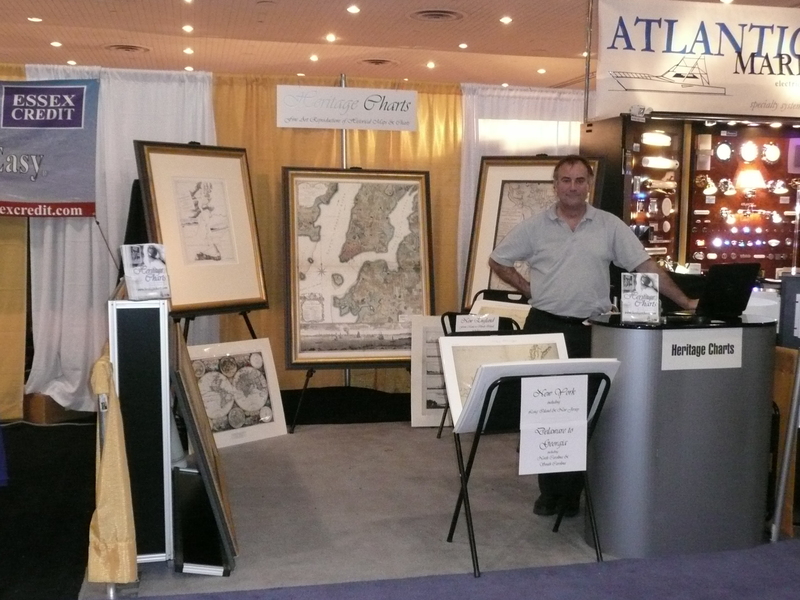 We were delighted to exhibit at the New York Boat show in January. It was a bit of a frantic rush to get everything ready in time and shipped over from London to New York in time, but we made it by the skin of our teeth! We had both been to New York before on holiday, but it was our first time exibiting at the boat show and we had a lot to learn in a very short time. We weren’t quite sure what to expect and our neighbours, Charlie and Aaron from Atlantic Marine Electrical Services Inc, were brilliant and helped us enormously to figure out the logistics. We were really pleased with our stand, and we attracted loads of interest both from people visiting the show, and from other exhibitors which was really nice. Many people came back several times to study the detail in the charts – and everyone had a bit of information to share about the locations or about the history. We learnt a lot both about the history of the charts, and it was really nice to be able to talk face-to-face with everyone. Next time we will definitely come with more charts of Long Island!